Aleppo (Halab) is famous for the diversity of food and love of eating. 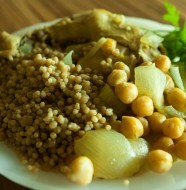 Tourists come from everywhere in the world to taste and experience the Aleppine Food. The cuisine has gained its fame long time ago, hundreds years earlier, when the city was part of the historical network (Silk Road) that connected cities of Afro-Eurasia together. 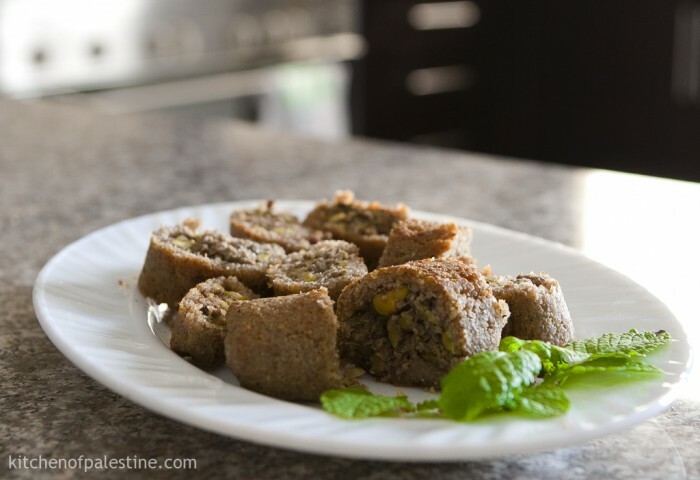 Originated in Aleppo; kibbeh (or kubbeh as called in Palestine) is popular in other areas of Levant. 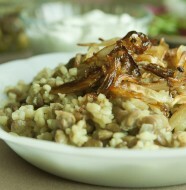 It is made of minced lean meat, minced onions and bulgur. There are more than fourteen types of kibbeh; the most famous type is fried balls stuffed with meat and nuts. 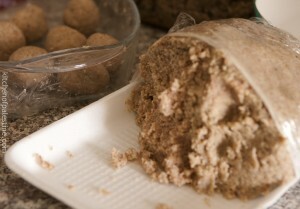 Other types have different shapes and different stuffing, kibbeh can be baked, fried, cooked in tomato soup, in yogurt sauces, or in chicken broth. 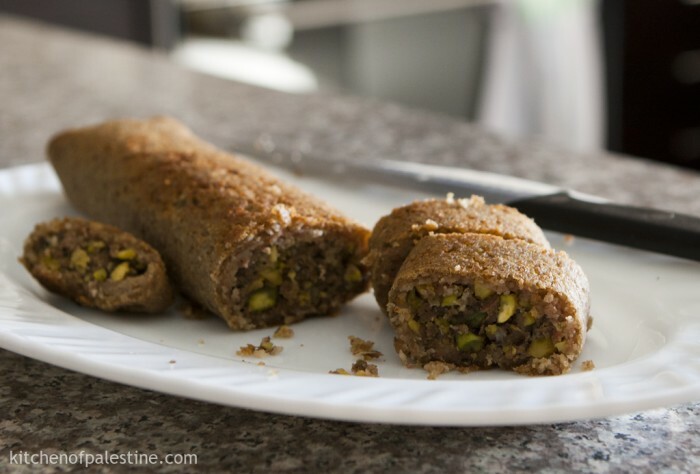 Among different types of Kibbeh, I chose to start with kibbeh rolls stuffed with pistachio. Why? Simply, it is the tastiest. For kibbeh dough: place onions, bulgur, and dough spices in a food processor Process them all for two minutes until become fine. Set the mixture aside. Place the meat in the processor and process for two minutes. Add the meat to the mixture of onions and bulgur. Knead the whole mixture very well using your hands. Add some cold water while kneading in order to make a moist and well compact mixture. Keep the dough cold until you need to use it. (It’s preferable to keep the dough in refrigerator for couple of hours). For the stuffing: heat olive oil in saucepan, add onions and stir over a medium heat until they become slightly golden. Add meat and spices. Stir from time to time until well cooked. Place cooked meat and onions in a bowl. 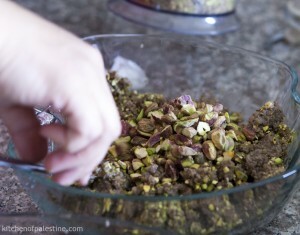 Add crushed pistachio and the egg, and mix very well. 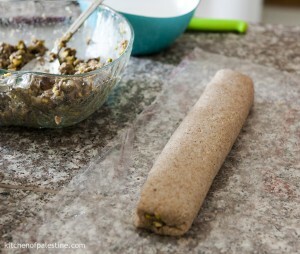 For rolling process: divide kibbeh dough to three parts. 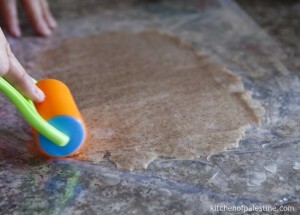 Spread each part over a plastic sheet (add some water drops to the sheet). 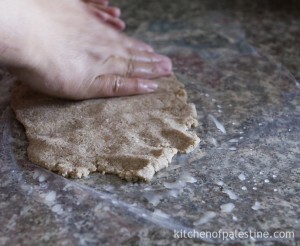 Put another plastic sheet over kibbeh dough. 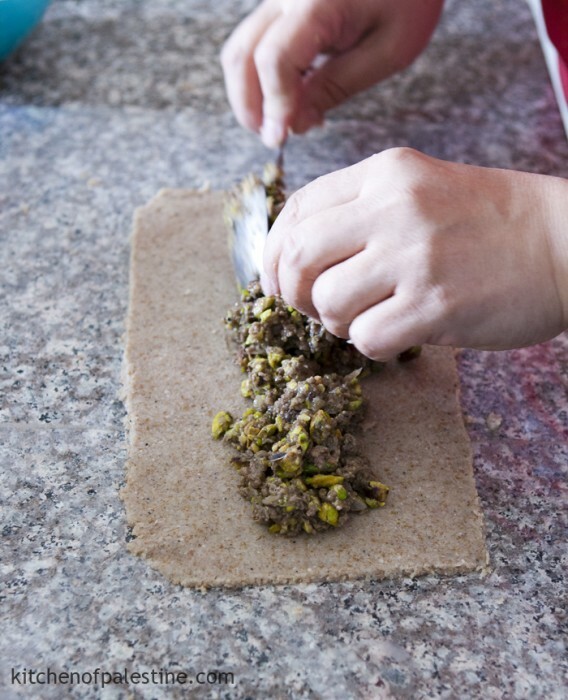 Using a rolling tool, make a thin layer of kibbeh dough. Remove top plastic sheet. 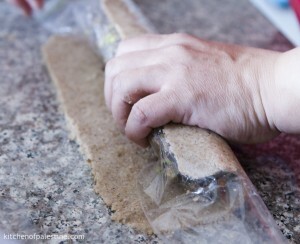 Using a knife, make a rectangular shape of kibbeh (about 30 X 15). 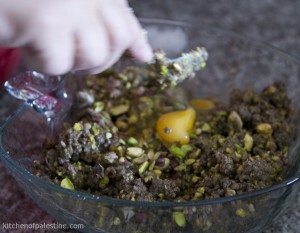 Add about 4 full tablespoon of stuffing and spread it across the kibbeh width. 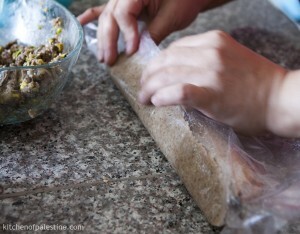 Using the lower plastic sheet, roll kibbeh forward toward stuffing while pressing in order to get a solid kibbeh roll. 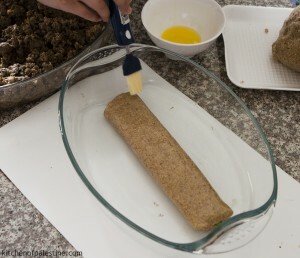 Grease kibbeh roll with butter from all sides and place it into an oven-proof tray. Bake kibbeh rolls in a preheated 180 c degrees oven for about 20 minutes or until they become brown-golden. Brush kibbeh rolls with butter from time to time while baking (2 to 3 times). Set them aside for about 15 minutes and then cut them into small rolls. Typically it’s served hot with tabbouleh and hummus paste. 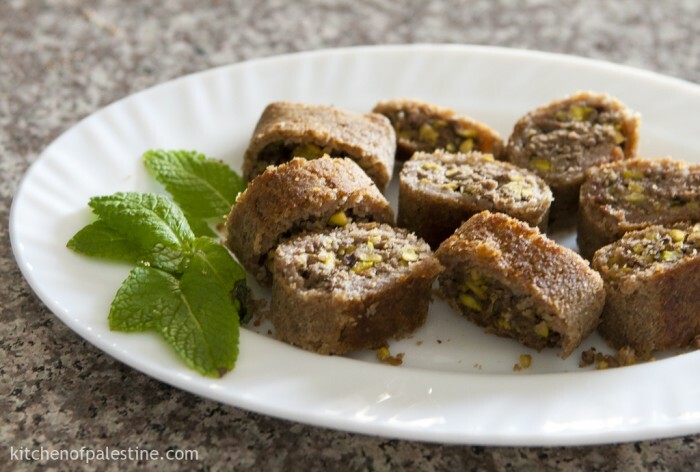 18 Comments on "Kibbeh Roll (Kibbeh Mabroumeh)"
I adore kibbeh and I will definitely make this tonight. What shall I serve with it, I was thinking of a hot potato salad-in vinaigrette not mayo-and a green salad. Sounds good.. Tell me how it goes. It’s typically served with tabbouleh or fattoush and hummus dip. I often make both those salads, but as kibbeh has Bulgur wheat, I thought that a green salad and hot potato salad would be good. I’ll be in Jordan later this year, got to be I’m running out of Zata’ar!! Fantastic, easy to make and the taste was gorgeous. I hadn’t got any of the right sort of potatoes to make salad, and the herbs in the garden are only just starting to appear, so we had sauté potatoes and green salad with it. Made 3 rolls, ate one and froze the others. Thank-you for the recipe; it looks really good! I’d like to know though how long you soak the bulgur for? 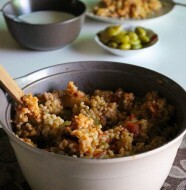 I only soak bulgur with room temperature water for 15 to 20 minutes just before using..
i did it, and came out so delicious! is a easy receipt and a new form to eat kibbeh. i am palestinian and i used to eat kibbeh in other forms but this one i love it , and i did not know this receipt! today i pass it to my cousin and she loved it too! I’m really glad that you like it. Yes it’s not very known even between Syrians. I tried it first time couple of months ago, and since then it has become my favorite kubbeh choice. What kind of Butter you use ? I use the original unsalted butter. Yes the egg is necessary so the filling won’t fall out when cutting kibbeh. I love kibbeh but never tried making it this way. This will definitely be a recipe i will try and keep. My teta is very famous for her kibbeh. Our hometown is known for its delicious kibbeh. Is the Lean beef part of the dough? Yes Hager. The dough should be made of 100% lean beef, bulgur, onions and other spices. As for stuffing, it can be made of beef or lamb.